Curtis Terry went 2 for 4 with three runs and Cristian Inoa added an RBI double. Starter Jake Latz (1-1) struck out four over five innings and allowed two runs on five hits and one walk. Aldemar Burgos had a two-run homer for Tri-City. 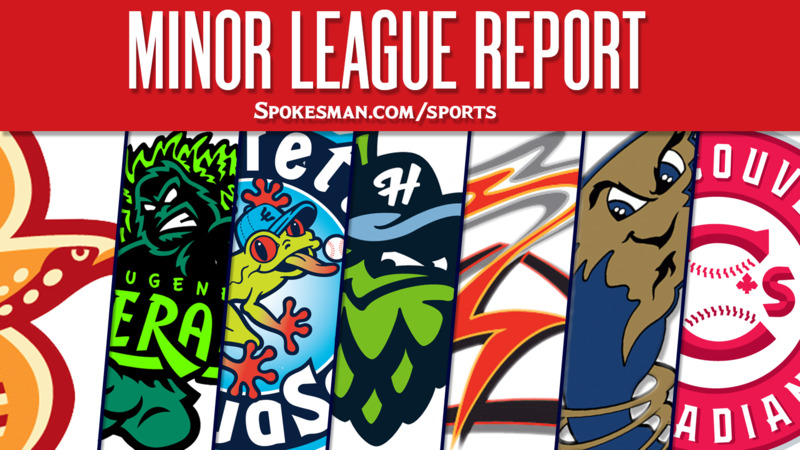 Everett 4, Vancouver 3: Jansiel Rivera hit a solo home run in the second inning and Everett rallied for three runs in the sixth and the AquaSox (12-8) edged the visiting Canadians (8-12). Connor Kopach went 2 for 3 with a triple and a run. Boise 11, Eugene 2: Luis Castro went 3 for 4 with a two-run homer and four RBIs and the Hawks (11-9) handled the visiting Emeralds (7-13). Willie MacIver hit a three-run shot and Kyle Datres added a solo homer for Boise. Whitworth grad Joel Condreay made his first pitching appearance in transitioning from shortstop for Boise. He gave up two runs on four hits in one inning. Salem-Keizer 15, Hillsboro 1: No. 2 overall pick in the 2018 MLB Draft Joey Bart made an impressive NWL debut, slugging two home runs with four RBIs and the Volcanoes (13-7) routed the visiting Hops (13-7). Bart finished 3 for 5 out of the cleanup spot. Kyle McPherson hit a grand slam and Jose Layer added a two-run shot for S-K. Round Rock (AAA) 8, Oklahoma City 5: Hanser Alberto went 3 for 4 with four RBIs and the visiting Express (40-45) topped the Dodgers (45-36). Scott Heineman went 2 for 6 with a solo home run and Willie Calhoun went 2 for 6 with a run for Round Rock. Richelson Pena (2-1) gave up two runs on seven hits with three strikeouts over five innings. Frisco (AA) 5, Springfield 2: Eliezer Alvarez hit a two-run home run and the visiting RoughRiders (33-50) beat the Cardinals (35-48). Ariel Jurado (3-3) allowed two runs on four hits and no walks with five strikeouts over eight innings. Winston-Salem 14, Down East (High-A) 5: Ti’Quon Forbes hit a three-run homer and the Dash (50-33) routed the visiting Wood Ducks (41-43). Andretty Cordero and John Altmann homered for Down East. Altmann gave up a run on three hits with a strikeout in one inning in a mop-up role. Kannapolis 4, Hickory (Low-A) 3: Johan Cruz scored on a potential double-play ball in the bottom of the ninth inning and the Intimidators (46-35) edged the Crawdads (37-45). Kannapolis tied it at 3-3 on an RBI single by Evan Skoug in the ninth. Later, shortstop Ryan Dorow’s throwing error allowed Cruz to carry in the winning run. Published: July 5, 2018, 5:55 a.m. Updated: July 5, 2018, 4:38 p.m.